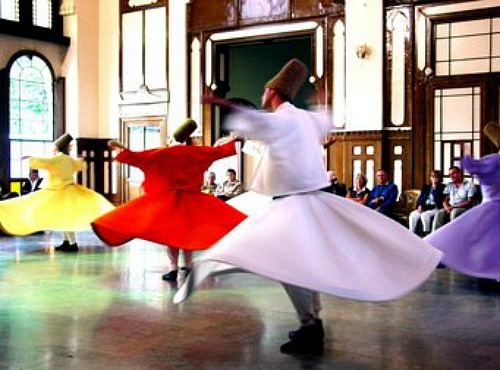 Sufi (Noble Connection) meditation is the cornerstone of Islamic spirituality. There is so much to write about Sufi meditation and Sufism in general that even an entire website may be incapable of doing justice to the subject. This page is an attempt to distill the essence of Sufism and pique your curiosity enough for you to explore the subject further at a later time. The name Sufi probably came from 'Suf', a white woolen blanket, which the mystics of this path are known to carry as their sole worldly possession. Although some people predate Sufism to Islam, its present form appears most heavily influenced by Islamic philosophy. Like the Eastern traditions, Sufism maintains that for the uninitiated, the material world is all that exists. He lives in appearances without realizing that the material world he inhabits and is so deeply attached to is nothing but an illusion (maya) draped over his eyes. Reality, though veiled, is readily accessible, but one has to first make efforts to lift the curtain of ignorance. The goal of Sufi meditation is oneness with the Supreme Reality. The defining characteristic of Sufi meditation is the presence of a mentor and his pivotal role in the seeker's spiritual progress. The relationship between the two is one of love (sohbat). Once the seeker is immersed in remembering his mentor every waking moment, a mental connection is established, which facilitates the transfer of knowledge of the Divine Attributes from the mentor to the seeker. With regular practice, the seeker starts experiencing higher and higher levels of spiritual awareness as his mind becomes fully attuned to that of the mentor. This is known as the state of Affinity. The quickest way to reach this state is through passionate longing for the mentor, similar to what one has for a beloved. This intense emotion establishes a direct bond with the mentor's mind leading to a rapid transfer of Divine Presence that envelops the mind and heart of the seeker. But, how can a person, totally immersed in thoughts of his mentor or the divine, go about fulfilling his day-to-day responsibilities? Fair question. I can speak fro my own personal experience that the process works. Constant remembrance of the mentor or the divine is in no way a hindrance to your daily activities. In fact, you will find that life runs on auto-pilot when you are immersed in such a state. Appropriate action at every step becomes the norm, while you continue with your quest. The mentor of the highest approach can quickly pull you up on the journey to self-realization. If you are fortunate enough to find such a mentor, then half the battle is already won. Otherwise, continue your practice with self-belief and confidence until a mentor appears in your life or the final stages of the path to "Oneness" themselves evident. On the path of spirituality, there is no 'right' way of doing things. Follow whatever comes naturally to you. Let us not forget that some of the greatest enlightened beings did not have any mentors. During Sufi meditation, the mentor is a mere conduit for Divine Experiences and the experiences must not be construed as the personal traits of the mentor. The mentor only serves as your connection to the Ultimate Reality.